Creative content examples come in many shapes and forms. This post contains an in-depth look at 13 of the most valuable types of digital content marketing. Interested in learning more about a specific type of content? Just click the list below to skip to each section. Search engines and site visitors love fresh, quality content. Blogging allows you to update your audience on a regular basis, and it gives you the opportunity to rank for more keywords related to your business. On your blog, you can share business updates, industry news, helpful tips, and more. 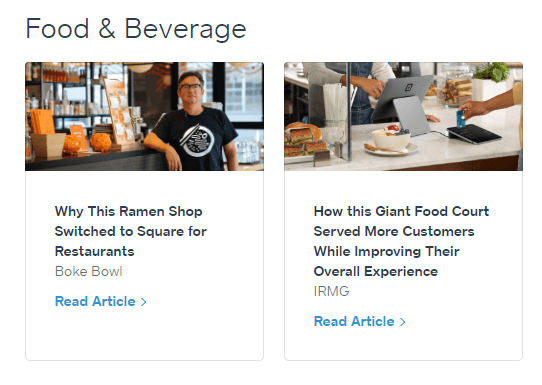 Campaign Monitor, an email marketing platform, does a great job of keeping their blog updated with clever content marketing that provides value to readers. In addition to sharing information about their software, Campaign Monitor posts helpful email marketing tips that provide added value to their audience. Why it works: Blogging allows you to share frequent updates and rank for more keywords online. It also positions your business as an authority in your industry and helps you provide value for customers. Visual content comes in many forms including videos, images, and infographics. Customers are 10 times more likely to engage with video content than blocks of text. Video marketing continues to gain prominence as a powerful digital content strategy. Not only does video marketing boost brand engagement, it also increases conversions. Adding videos to landing pages can help you earn 80 percent more conversions — and ultimately more revenue. In addition to sharing videos on your website, you can also post them to social media sites like YouTube to reach even more people. Popular ridesharing company, Lyft, leverages creative video content with their “Undercover Lyft” series on YouTube. The videos, which feature celebrities posing as Lyft drivers, boost brand reach and encourage engagement. Why it works: Video marketing improves your company’s reach and engagement, while giving viewers an inside look at your products, services, and culture. You’re also 53 times more likely to rank on the first page of Google search results if your site includes video content — so it packs a powerful SEO punch. Content with visuals gets 94 percent more views than text-only content. Nobody wants to scroll through blocks of text online. So, if you’re looking to step up your creativity and connect with more people, adding images to your content can help. You don’t need to be a professional photographer to incorporate images in various types of creative content marketing. Simple photos of your products, office, and staff showcase what makes your brand unique and help site visitors visualize your offerings. 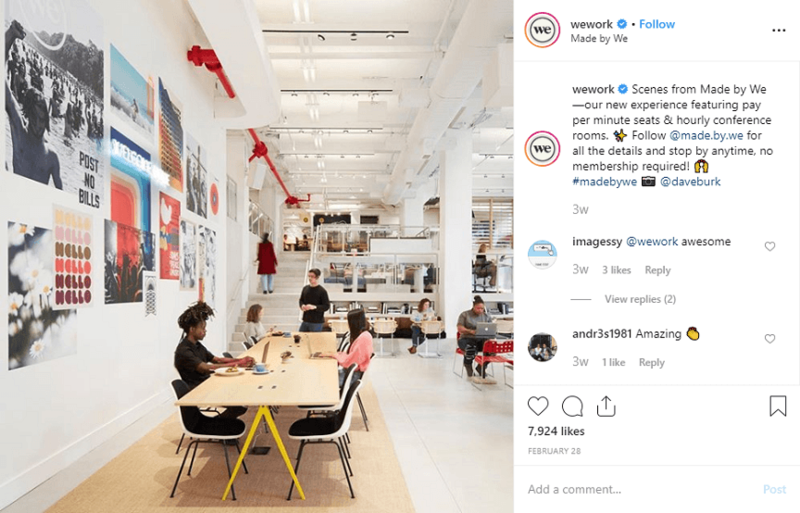 WeWork, a company that creates custom, shared office spaces, highlights their offices with bright, fun photography. Sharing the images on their website and social media gives clients an inside look at the WeWork experience and beautiful spaces they create. Why it works: Custom images and graphics set your content apart from competitors’ pages, showcase your brand’s personality, and boost content views. Infographics present key data in visual form, making it easier to digest. Data visualization boosts brand engagement and makes it easy for potential customers to find and process valuable information. Since 65 percent of the population are visual learners, infographics appeal to a large audience, and they attract traffic to your site. 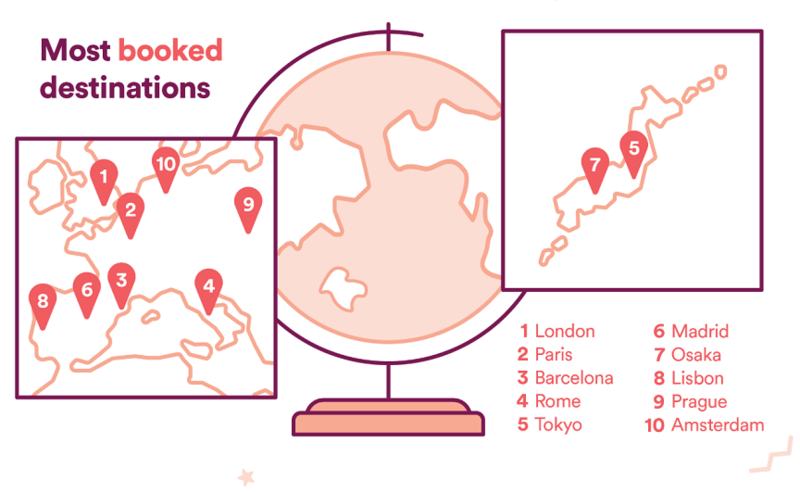 Travel brand Airbnb created a clever infographic to highlight summer travel trends and promote booking options and Airbnb Experiences. Why it works: Infographics have incredible potential for re-sharing, and they’re great for earning backlinks to your site. In addition, they break down important information in a way that’s easy for your customers to understand and take action. Case studies provide powerful social proof that validates your brand’s credibility. Nearly 83 percent of people trust recommendations from other people as opposed to branded ads. Sharing case studies and testimonials from customers allows you to demonstrate the results you drive. Payment processing app Square uses case studies to highlight how their services drive success for clients. Their case studies feature engaging photography and testimonials from businesses who use Square. Why it works: Case studies allow you to demonstrate the results you drive for clients, and they provide social proof that encourages people to work with you. Ebooks, guides, and long-form content serve as valuable resources for site visitors. They allow you to provide in-depth information related to your business. In addition, you can “gate” ebooks and guides and require people to enter their email addresses to gain access. This is a great way to grow your email list, and you can follow up with more helpful information. Jenna Kutcher, marketing entrepreneur and Instagram guru, shares free guides on her website, like this creative “Captions that Convert” guide. 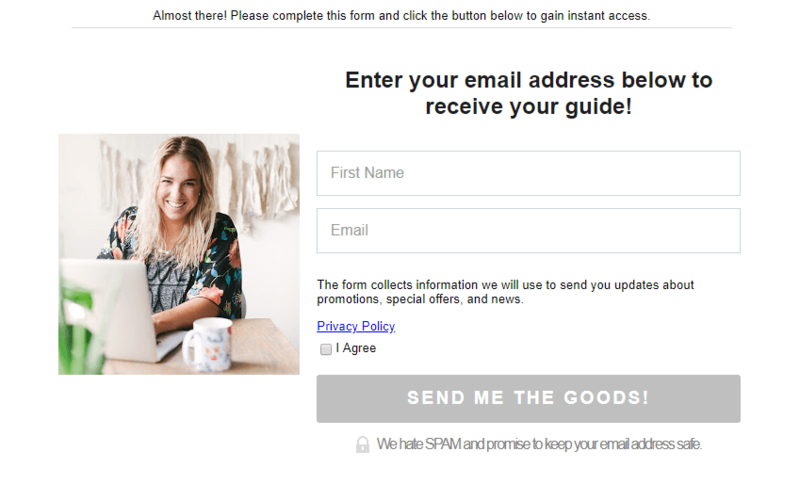 Clicking to download launches a pop up that requires visitors to enter their names and email addresses to complete the download. Why it works: Ebooks and guides provide value to potential customers, while positioning you as an industry leader. You can also use long-form content to grow your email list and follow up with people who download. In addition to sharing content on your website, you can kick your content marketing up a notch with this type of creative content — social media posts. Sites like Facebook, Twitter, and Instagram allow you to create paid advertisements, as well as free business profiles. Posting on social media gives your audience an inside look at your brand. You can even repurpose website content for social media. Sharing images and videos in addition to text posts will boost engagement with your brand and encourage re-sharing. 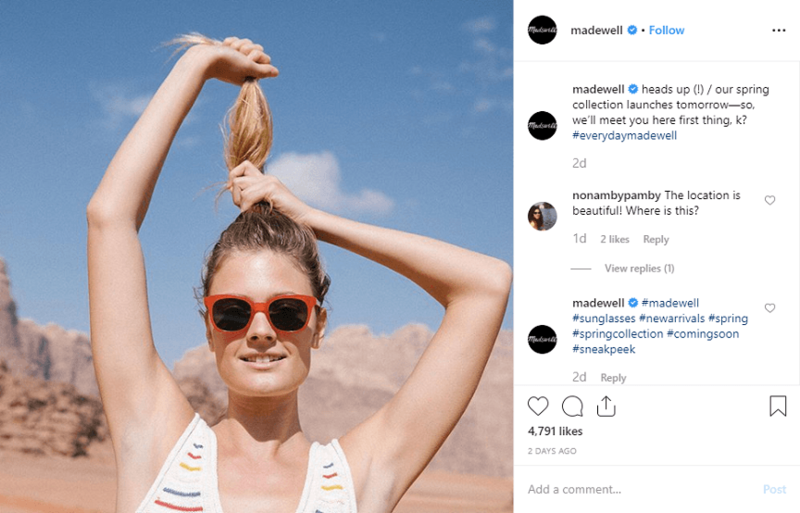 Fashion brand Madewell curates a social presence that reflects their brand image, and they post outfit inspiration that encourages people to visit the site and shop. Why it works: Social media offers the opportunity to connect with current and potential customers. More than 2.3 billion people use social media today, and marketing on social platforms helps you foster engagement among a wide audience. Sharing quality content on a regular basis is time-consuming. User-generated content lets you leverage the power of fans and followers for creative content marketing. Posting user-generated content helps you keep your site fresh. Plus, people love seeing themselves featured on your site and social media. To celebrate reaching 100 million Instagram followers, National Geographic launched a content to encourage followers to share their photos with #natgeo100 contest for a chance to win a safari to Tanzania. 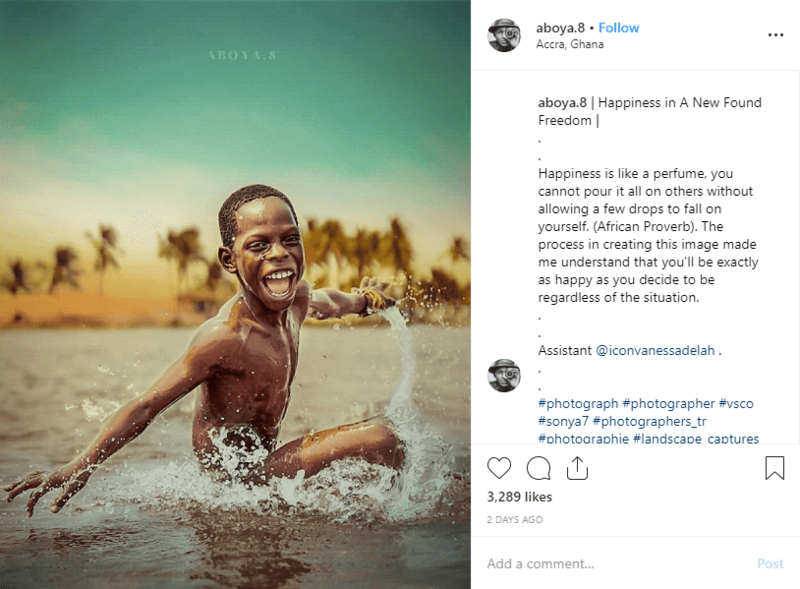 Launched in February 2019, the contest has generated more than 140,000 posts on Instagram, and it provides Nat Geo with a trove of content to re-share on their site and social platforms. Why it works: Word-of-mouth marketing generates twice as many sales as paid ads. User-generated content allows you to leverage word-of-mouth marketing while keeping your content strategy up-to-date. After compiling your email list, you can send leads creative newsletter content. Whether you send your content on a weekly, monthly, or quarterly basis, email newsletters help you keep in contact and develop relationships with subscribers who are interested in your business. Great for lead nurturing, email newsletters can contain business updates, industry news, and helpful insights. You can also use the information you collect when people download guides to follow up with personalized information on topics that interest them. 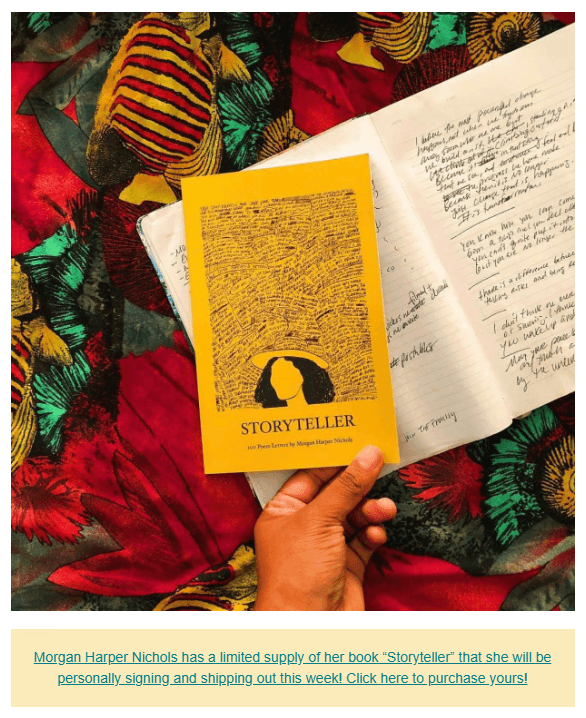 Author and poet, Morgan Harper Nichols, puts a spin on traditional email newsletters with her daily emails containing short poems and art. She also uses email to update subscribers on events, like the launch of her new book. Why it works: This type of content marketing can earn you $44 for every $1 spent — an ROI of 4400 percent. Newsletter content is great for lead nurturing, and it allows you to send valuable information, directly to leads’ inboxes. According to the Content Marketing Institute, 75 percent of people say content with data is more trustworthy. Data backs up key points in your content, and publishing original research and data positions your company as a thought-leader in your industry. Content containing research and data is great for driving traffic to your site, and you become a go-to resource for information related to your business. You can even turn your research into SlideShare content to increase sharing potential. 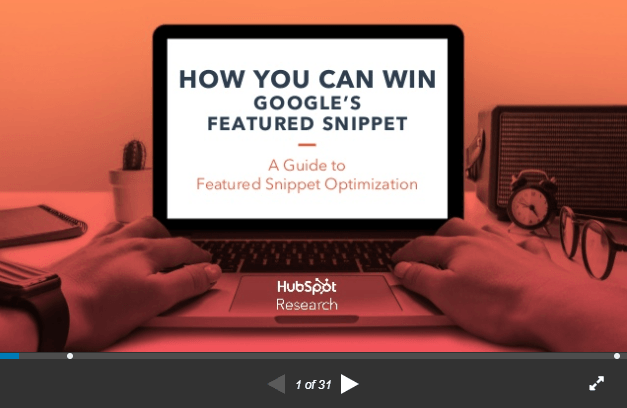 HubSpot keeps their site updated with original research, and they combine data and graphics into helpful SlideShare presentations. Why it works: Original research and data adds credibility to your content and makes it more trustworthy. In addition, sharing research drives valuable traffic to your site and positions your brand as a go-to resource. A fast-growing type of content, webinars generate high-quality leads, boost brand awareness, and increase understanding of products and services by 74 percent. In addition to their lead gen potential, webinars allow you to provide added value to existing clients. For example, you can host webinars to demonstrate how your products and services benefit customers. You can also partner with industry influencers and experts to co-host webinars. This gives you access to a wide audience, and you can encourage attendees to share webinar recordings with people who may benefit from your products. Google Partner’s Academy on Air webinars give viewers valuable marketing insights and tips reaching their business goals. These livestreams provide added value to Google Partner agencies and encourage companies to experience the benefits of becoming a Google Partner. Why it works: Webinars help potential customers learn more about your offerings and serve as valuable resources for existing customers. Not to mention, they demonstrate your authority and allow you to partner with key figures in your industry. I love a good true crime podcast binge as much as the next girl. But have you considered podcasting for your business? Podcasting continues to gain momentum as a content marketing tool. With 21 percent of U.S. adults listening to at least one podcast per month, podcasts help you expand your online reach. Like webinars, podcasts also allow you to showcase your expertise and set your brand apart from competitors. If launching your own podcast seems like a daunting task, you can consider advertising on popular, industry podcasts. Cohosted by freelance writers Kaleigh Moore and Paul Jarvis, the Creative Class podcast is a go-to resource for freelancers. Episodes feature tips for pricing, landing project, and communicating with clients. The podcast spotlights the hosts’ freelancing expertise, and it’s the perfect way to advertise Creative Class, the pair’s online freelancing course. Why it works: Podcasting provides a unique channel for reaching more customers, and it positions you as an expert in your field. Great for answering commonly asked questions and showcasing your expertise, Q&A posts and interviews are hallmarks of creative content marketing. In addition, Q&A posts and interviews are prime for blog-sharing. Answering questions in the form of Q&A posts also helps you earn featured snippets — search results that directly answer questions and appear above organic results. For added engagement, consider inviting followers to submit questions for you to answer in the posts and interviews. The WebFX talent acquisition (TA) team recently answered some burning questions in this Q&A post on our blog. Helpful for recruiting, this post (and awesome insights from our TA team) is a valuable resource for applicants. Why it works: Q&As and interviews allow you go answer frequently asked questions (FAQs), highlight your knowledge, and pack a punch when it comes to engaging leads. If you’re looking to lower your site’s bounce rate, interactive content and tools keep visitors engaged on your site. Interactive content includes quizzes, polls and surveys, interactive videos and infographics, and more. You can even create custom assessment tools and calculators. Worried about the development resources necessary to create interactive content? Don’t fret. Start off simple by introducing some interactive surveys and quizzes. Not only do these tools provide value to visitors, they also allow you to capture data you can use to shape your marketing campaigns. 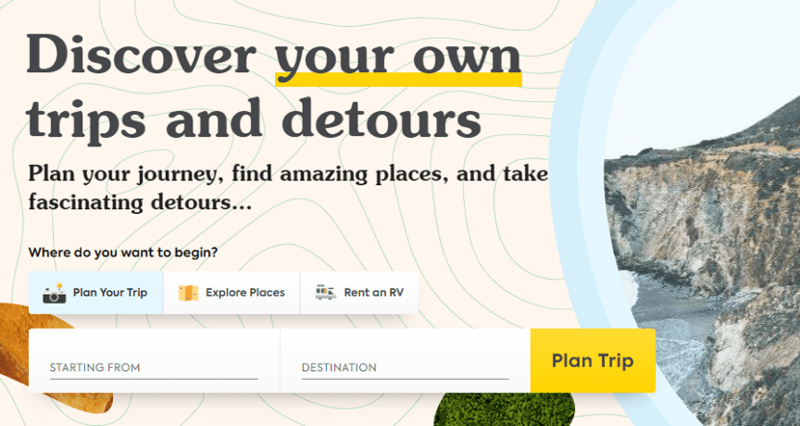 Roadtrippers, a mobile app for planning unique road trips, puts interactivity at the forefront of their site design. 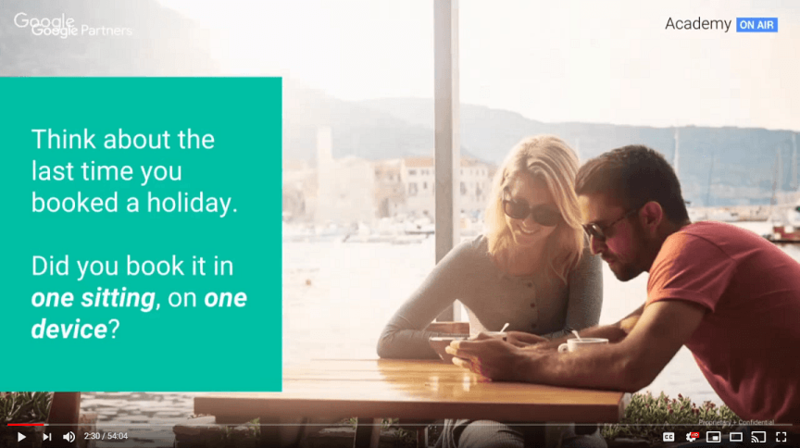 Coupled with engaging road trip guides, the site features a number of tools that allow travelers to plan and customize trips. For example, their homepage allows visitors to enter their starting and final destinations to create a map of their trips, complete with detours and pit stops and featured locations. Why it works: Interactive content and tools boost engagement, decrease site bounces, and add value for site visitors. Live chat uses the power of content marketing for real-time interaction with your audience. An estimated 79 percent of people want instant answers when shopping online, and live chat gives you the functionality to interact with them in real-time. Platforms like Drift allow you to chat with site visitors, invite them to ask questions, and help them learn more about your business. You can also use live chat on social platforms like Facebook Messenger, where you have the option to manually respond or automate your live chats. For ecommerce stores especially, live chat is extremely beneficial for streamlining the purchase process and providing the support needed to reduce shopping cart abandonment. Retail brand Urban Outfitters offers a seamless live chat experience for customers to interact and ask questions throughout their shopping experience. 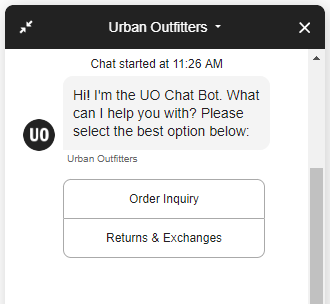 The UO chat bot walks visitors through a series of qualifying questions to identify the best solution, and it gives shoppers the option to chat with a customer service rep.
Why it works: People want instant answers when shopping online, and live chat gives you the ability to interact in real-time, collecting information from leads and sharing helpful information. If these types of creative content and examples inspired you to give your content marketing some TLC, you came to the right place. WebFX offers custom content plans designed to help you rank in search results, engage leads, and provide them with the info they need to take the next step with your brand. Check out our content marketing services to learn more, and contact us today to get started!